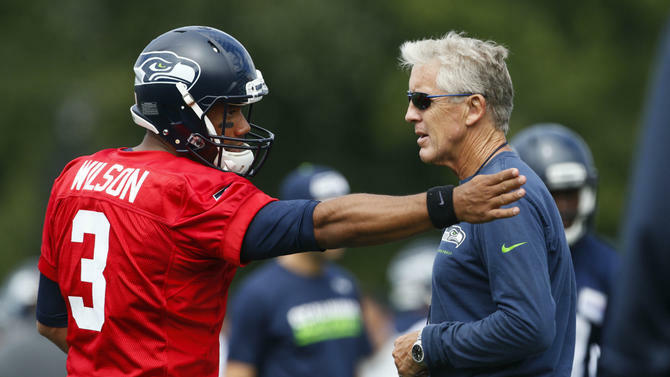 RENTON, Wash. — Russell Wilson is a man of many mantras. He has certain sayings or quotes that drive him — perhaps even define him in certain ways — that are culled from motivational speakers or mental-conditioning experts, or even the Bible. They are hardwired into his brain and they get sprinkled, at times liberally, throughout conversations. They speak to his unwaveringly positive approach to football, and to life. “Keep the main thing the main thing” is one of them. It’s a nod to his focus and determination, and not getting caught up in drama or ancillary distractions. 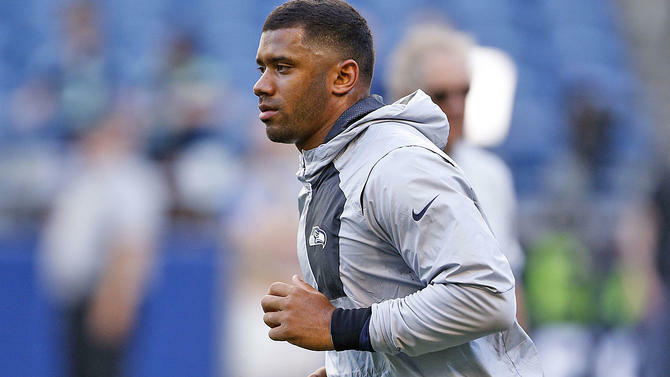 If Russell Wilson‘s brand is anything, it’s that hard work trumps all. Don’t let others shape your goals. Believe in yourself. Nothing is impossible. Keep the main thing the main thing and focus on what really matters, and you can accomplish whatever you set your mind to. But in what was one of the wildest whirlwind offseasons of any NFL player in recent memory, well, even the most ardent Wilson supporter may have questioned the quarterback’s jet-setting lifestyle. 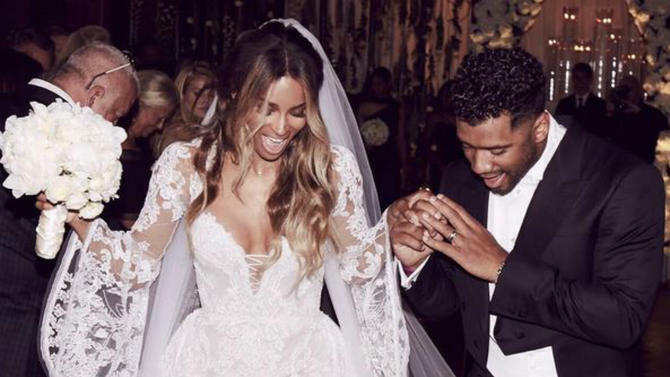 To recap: Wilson married his celebrity girlfriend, Ciara, in London while being swarmed by the international paparazzi (with all 24 members of Earth, Wind and Fire playing the reception while sporting wedding attire custom designed by Armani), took Fashion Week in Paris by storm, started his own clothing line and become the subject of possible threats from his wife’s ex (rapper Future). The new power couple also walked the red carpet at The ESPYS and Wilson also hosted the Nickelodeon Kids’ Choice Awards for a second straight summer. The notorious homebody whose late-night activities seemed to consist previously of tweeting Bible scriptures was now showing up on “ET” and “Extra” and on the cover of Hollywood gossip glossies. It would be impossible for even someone like Seahawks coach Pete Carroll, as big of a champion of Wilson’s as you will find, not to wonder on some level if Wilson was in fact keeping the main thing the main thing to the extent that the former third-round pick had in each previous spring. With so much going on, how could he, right? Well, fear not, Coach Carroll, Seahawks fans, Fantasy football team owners and, heck, anyone who just enjoys and relishes the joy with which Wilson plays this sport. Even when shooting across the Atlantic, Wilson swears he was keeping the main thing the main thing. He, more than anyone else, still realizes the importance of keeping the main thing the main thing. He knows no other way but to KTMTTMT. Wilson is in the best shape of his life coming off the best individual season of his life, and he is clearly having the time of his life, all the while computing the complicated calculus of maximizing the waking hours in the day and juggling his various pursuits. If anyone can pull this off, people, it’s Russell Wilson, and he’s already got everyone around this training camp convinced that despite all that has changed, what really matters about this quarterback has remained the same. “He did not back off it at all,” Carroll said. “His workouts, his conditioning, his mentality is great. He did everything he possibly could. He had a great offseason. He was right on it every step of the way. He’s been able to budget himself and his time such that he could be at the very best of his game, and still have a very, very wonderful marriage and a happy ceremony and all of that, and he shared it with his friends and loved ones and he did it. Carroll and Wilson speak the same language, and share so many core beliefs, about the power of positive thought and visualizing your accomplishments and in the ability for mind to rise above matter. “There is no such thing for me in my mind as negativity,” Wilson told me at one point in a tone in which I truly believed him. Wilson can understand how, to an outsider, it may have seemed as if he was doing a little too much, caught up in the star culture. But he is adamant that he continues to take counsel from the same inner circle he always has, to continue to put the three Fs — faith, family and football — above all, and to implement the same ridiculously grueling offseason training regimen as he always has, even if it means taking a personal trainer or nutritionist to Europe with him. But surely Wilson cuts an occasional corner here or there. I mean, he is human. So like in France for Fashion Week, you’d expect he probably just eats whatever he wants (he doesn’t drink or smoke), wakes up at noon and makes a proper vacation out of it, not obsessing about every moment not spent in the gym. Or, he brings a trainer and others with him and still gets in multiple workouts a day and works on his mechanics and delivery religiously. Which seems more like Russell Wilson to you? Back here in Seattle, some were experiencing a bit of Russell/Ciara fatigue, unaccustomed to seeing their overachieving quarterback now a man of the world and living life boldly and very much publicly. There were whispers about success going to his head. Can’t he just be content to make his $20 million a year and win football games? Opinions still seem split here after talking to locals for three days, and, heaven forbid the Seahawks start slowly like last year, this spoiled fanbase will have no shortage of spousal-related conspiracy theories to start chucking around. The thing is, when you are so uniquely good at doing something as immensely difficult as what Wilson does for a living, certain spoils are going to come along. And while some might point to Jay Cutler on one end of that celebrity-spouse spectrum — and lord knows what they’ll be saying about Aaron Rodgers‘ actress girlfriend if he doesn’t have a big season — I could point to a certain Tom Brady, known to globe-trot with a trainer and various personal coaches in tow, as Exhibit A in how to navigate all of this with aplomb every Sunday. “A lot of people always say, ‘Man, is he doing too much? '” Wilson said. “And as I’ve said, I love and I am passionate about what I do. And it’s funny when you come into the National Football League and your first year you have the rookie symposium and one of the first things they tell you is, ‘Be ready for Plan B. The NFL is Not For Long.’ And it’s true, not for long. His teammates still swear by him, privately and otherwise. If he was slippin’, trust me, the cats around here would tell him. 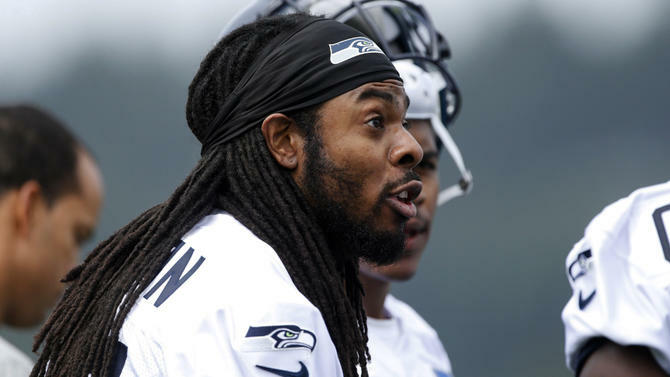 Wilson faces a potentially historically significant defense everyday in practice, with no shortage of outsized and outspoken personalities like cornerback Richard Sherman. If Wilson was truly going Hollywood and losing touch of his core values, it would be dissected quickly on the field and in this locker room, and folks would not be bashful about sharing their thoughts with Wilson. When asked if Wilson has changed in any meaningful manner, Sherman is quick to endorse his quarterback (who now gets to assert an even more vocal leadership role with running back/alpha dog Marshawn Lynch retired). Wilson remains the first guy in the building in the morning and the last to leave at night. He still yearns to be a beacon of positive influence in his practice habits and study habits. A staunch defender of the quarterback: receiver Doug Baldwin, the primary beneficiary of Wilson’s otherworldly play in the second half of last season, which lifted Seattle back to the postseason and ended up with Baldwin catching 12 touchdowns in the final two months alone before receiving a massive new contract. He’s also yet another straight shooter on this roster and not one to damn with faux praise. So while Wilson does have a professional stylist now and is wearing more high-end clothes than he was as an unknown rookie, his drive is just as relentless. The outward perception of Wilson, however, began to change around midseason. First, he drew a Tony Romo-esque backlash for having the temerity to go to Mexico with his then-fiancée on the bye week. How dare he! Especially with the Seahawks struggling! Then he had perhaps the worst clunker of his career in a loss to rival Arizona in November, going just 14 for 32 for 240 yards with a pick and a touchdown in the tough loss, dropping Seattle’s record to an unacceptable 4-5 and prompting questions about their Super Bowl loss hangover and Wilson’s off-field pursuits. To watch Wilson in that postgame press conference was unlike anything I’ve seen to this point in his career. The honeymoon was over. The narrative of the undersized quarterback who sleighed the dragon was gone, and Wilson was now ripe for a grilling. He became the embodiment of the local frustration with the football team. This is a league of far more failure than perfection, and at some point the inquisition from the fans, or media, or teammates, finds everyone. 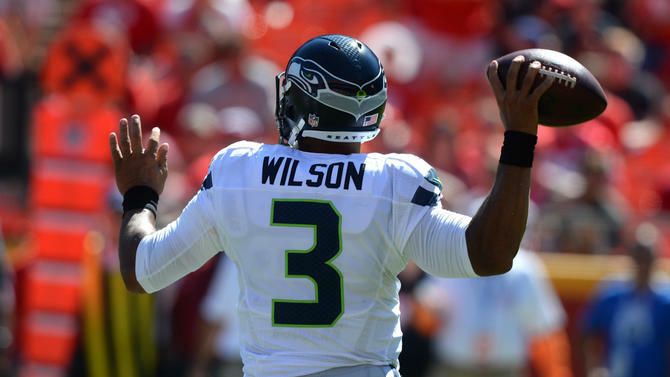 For Wilson, it came in the middle of last season, when the term “Celebrity Quarterback” was lobbed at him. I asked Wilson if he could feel the tide turning against him in the aftermath of that Arizona loss, and, after displaying false-ambivalence — “I don’t know what you’re talking about,” he deadpanned — it became clear that this was a turning point of sorts. “Ultimately, I ignore the noise,” Wilson said. “I always say that, and that’s the truth. Playing quarterback in the National Football League, I always realize I am one of just 32 men in the world that get to do what I get to do. And people expect you to play at a high level and that’s what I expect, most importantly. And that’s what we expect. So you always want to find ways to win and we’ve won a lot of football games … and there is no fear. The reality is, you can’t bring Russell Wilson down. Period. That may irk some, but it comes from a genuine place. He’s not saying this with a sense of bravado, and this is not someone who holds himself above others. His genuine outpouring of support to Seattle Children’s Hospital, the way he interacts with fans, even the way he moved around to every member of our camera crew before we sat down for this interview, shaking hands, introducing himself, remembering names, connotes someone who is very much of the people. It’s just that nothing that you can say about him will sway him from his eternal belief in what he is capable of. You’ll never convince him his dreams are too big, and he’ll probably just prove you wrong in the end, anyway. So of course Wilson was the most dominant player in the NFL in the final seven weeks of the season, after the Arizona loss. How could it be any other way? Yes, he went out and threw 24(!) touchdowns to one interception down the stretch and willed Seattle back into the playoffs. Yes, he led the NFL in touchdowns, yards per attempt (8.78) touchdown/interception percentage and quarterback rating (132.8) in the final seven weeks, and was second only to NFL MVP Cam Newton in interception perception (0.5 to 0.4) in that span. And he did so playing in the pocket, largely and within the confines of a traditional offense and with largely the same offensive line that got him sacked 31 times in the first seven weeks (the Seahawks did change centers). And he did it while he was planning the wedding of the year (or whatever) with his celebrity wife (he calls the decisions on Earth, Wind and Fire and Armani “a collaborative” decision, by the way) and despite that bye week trip to Mexico. And Carroll, for one, doesn’t believe it’s out of the realm of possibility that Wilson maintains that bizarro-world level of production for all of 2016. It won’t surprise Russell Wilson, either. I’m sure he’s already dreamed it and schemed it and hashed it out. Because playing at a dominant level and fulfilling what he believes is a Hall of Fame destiny is very much a part of keeping the main thing the main thing. And keeping the main thing the main thing is still very much a big part of Russell Wilson, even if he’s on a private plane on a transatlantic flight to a European fashion capital.